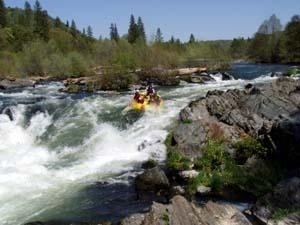 The seven mile half-day rafting trip is a very unique opportunity for anyone wanting to experience a thrilling Oregon whitewater rafting adventure! Beginning with class I rapids and progressing in order through class II, III and finishing with two exhilarating class IV rapids; Hayes falls & Powerhouse. High Country guides always offer folks not looking to engage in class IV rafting the option to walk around the last two rapids. Paddle rafting, where the entire crew works as a team in powering and maneuvering the boat down the river. Stern assists, an option used to give the guide extra control and power in assisting you on the journey is our most popular method on the Rogue. It gives you more time to take in the scenery and still be a part of the trip; it is also a nice feature to have on the flat stretches of water.